Preheat oven to 400 degrees-F. In a large mixing bowl, mix flour, baking powder, and salt, and set aside. Place 1/2 cup chopped strawberries and 1/4 cup sugar in a small pot over medium heat. Cook until strawberries are broken down and sauce is thick, approximately 8 minutes. Pass sauce through a fine sieve and discard the seeds, set the sauce aside. Place the remaining strawberries in a small mixing bowl and toss with the remaining 1/2 cup granulated sugar. In a small mixing bowl, beat egg with a fork. Add buttermilk, oil, and vanilla extract and stir to combine. Add wet ingredients to dry ingredients and mix with a fork just until combined. Add the chopped strawberries and sugar mixture and stir until distributed throughout batter. Add reserved strawberry sauce and stir until just incorporated. 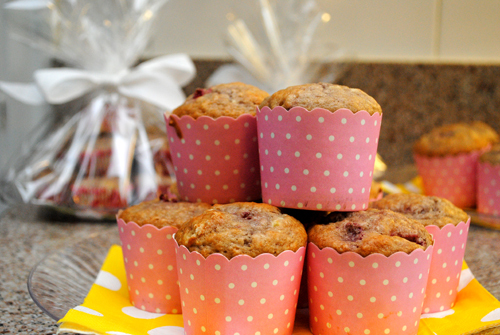 Fill 12 muffin cups with liners or spray with cooking spray. Drop batter into muffin liners by the spoonful evenly among the cups, filling to the brim. Bake for 18 to 20 minutes or until an inserted toothpick comes out clean. Remove muffin pan from oven and let muffins cool in pan for 5 minutes. Remove muffins from pan and let cool completely on a cooling rack. Serve immediately or store in airtight container for several days.